The university will be transitioning to Workday as a replacement for its financial systems (PeopleSoft, eReports, eTravel, eRequest). Currently we are in phase 2 of this transition. More on this is available in an article from CFAES Weekly from Eric Bode. If you have a purchase order that you renew annually please be sure to call your vendor and have the new PO number added to the invoices. They can put the PO number in a specifically designated spot OR they can add it to the address line. This will expedite payments. The PO number can be found on the eRequest in the Transaction ID field or the Quote ID field. · Mileage: night and weekend travel is only allowable if not traveling to and from headquarters. Mileage is never reimbursable if you are traveling to or from headquarters. · Agenda: attach your meeting agenda (showing provided meals) to your T number request or your T number reimbursement form. · Airfare: attach your itinerary for airfare in addition to your payment receipt to your T number request or your T number reimbursement form. · Guests: guest travel needs to be authorized on a university T number if university funds are going to prepay for any expense or a PCard will be used for the guest. Other payments should be made personally by the guest and submitted for reimbursement directly to the traveler. In an effort to improve efficiency we are phasing out the Travel Request Form in an effort to have employees request their own T numbers via https://eTravel.osu.edu. What should you know? · No training is required for employees entering their own travel – but training is offered by the university if desired. Email Brian McClain if you would like to know what trainings to take. · Allow five business days to get an assigned T number before you start making your reservations. · Always get a T number – it is better to always get a T number prior to traveling as it speeds up your reimbursement. · Watch for a one page job aid on entering T number travel coming soon. · Guest travel or travel on behalf of someone else will still need to be entered by a Travel Arranger, someone who has taken training and been given access to do this. · We are also working to get all approvers access to approval travel in the system. Approvers can see this checklist for assistance. Staples is the required supplier for office supplies for campus and off-campus employees. 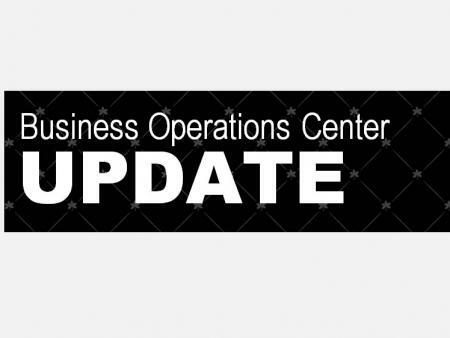 Business Operations has an FAQ page for this contract which includes the following and more. Q. Does Staples offer educational items like supplies for 4-H camps, etc? Order Item number 1785157 for a general printed catalog. Q. There are a lot of items missing from the catalog, can I not purchase them? A. The catalog is designed for basic office supplies but other items Staples sells can sometimes be added to the online catalog. Email your Business Operations Center representative with the item number you wish to add (found at Staples.com or in their catalog) and we will ask. This process may take a day to complete. Q. Does this contract and terms apply to non-Columbus locations? Q. Can I visit a local Staples and make a purchase? A. You can visit a local Staples and make a purchase in emergency situations only. Shopping in-store will not offer you the contract pricing available to the University on eStores. Staples offers an in store option with the PCard but this is not permitted for FAES units. · Cash or gift cards that are purchased with univ funds are taxable income for the retiring employee. · Gifts and celebration expenses must be approved by one level higher than normal approval. · Gifts over $100 require FAES dean approval before purchasing. · Gift total is cumulative including those given by other units or given in the previous five years for length of service awards. · Gifts totaling more than $400 are taxable – even for non-cash/gift cards. · Celebration expenses do not count towards taxable income unless considered excessive. A lifetime membership is permissible if the cost is lower than the annual memberships over the employee’s anticipated tenure at the university. Because a retiring employee would only have a maximum 1 year tenure, payment cannot exceed the one year membership rate. If chosen, a unit can pay the individual for that amount and the retiree can pay the difference to get a lifetime membership. · Due to retirement benefit restrictions, nothing can be paid to a retiree in their first 60 days post retirement. This includes reimbursement for travel that occurred post retirement. · Also the university cannot pay on behalf of the retiree (e.g. conference registration) during that 60 day period. Paying emeriti for a one time or small service is very cumbersome and not generally allowable by FAES. · We shouldn’t pay emeriti for small things. For small efforts it is appropriate to give them a non-cash token of appreciation (not a gift card). · For more significant, or ongoing, tasks we must go through the full hire process for a new employee. If an emeriti has a private company and are doing something different than what they did as an employee, we can sometimes set them up as a university vendor. Refer people to Brian if emeriti ask for this option. 1. Use the new form: The form was posted in July with the new year’s convenience order number. 2. Remind your volunteers that the check will come from OSU: Please remind them that the check will not say 4-H but OSU instead. 3. Clear the volunteer names off the list each month: Please be sure to only send one month at a time to prevent duplication of reimbursement to the volunteers. If you are having any problems see help documents here and email if needed. o Refund – Procurement – Refunds – Training page added for processing refunds. · FAQ on Inflatables - News – this describes the purchasing procedures for bounce houses and similar games. · Extension Educator Cost Share – Resources – Salary & Benefit Calculations – CY2017 cost share and FY2017 benefit rates posted.